The Petit Basset Griffon Vendéen is a French scent hound developed first and foremost to hunt small game over the rough and difficult terrain of the Vendéen region. To function efficiently, he must be equipped with certain characteristics. He is bold and vivacious in character; compact, tough and robust in construction. He has an alert outlook, lively bearing and a good voice freely and purposefully used. The head is carried proudly and, in size, mu st be in balance with the overall dog. It is longer than its width in a ratio of approximately two to one. A coarse or overly large head is to be penalized. Expression alert, friendly and intelligent. Eyes large and dark with good pigmentation, somewhat oval in shape, showing no white. The red of the lower eyelid should not show. The eyes are surmounted by long eyebrows, standing forward, but not obscuring the eyes. Ears supple, narrow and fine, covered with long hair, folding inward and ending in an oval shape. The leathers reach almost to the end of the nose. They are set on low, below the line of the eyes. An overly long or high-set ear should be penalized. Neck– The neck is long and strong, without throatiness, and flows smoothly into the shoulders. Topline– The back is visibly level from withers to croup. There is a barely perceptible rise over a strong loin. Viewed in profile, the withers and the croup should be equidistant from the ground. Body muscular, somewhat longer than tall. Compact, casual in appearance, with no feature exaggerated and his parts in balance. Chestrather deep, with prominent sternum. Ribs moderately rounded, extending well back. Loinshort, strong, and muscular. There is but little tuck-up. Shoulders clean and well laid back. Upper arm approximately equal in length to the shoulder blade. Elbows close to the body. Legs – The length of leg from elbow to ground should be slightly more than half the height from withers to ground. Viewed from the front, it is desirable that the forelegs be straight, but a slight crook is acceptable. In either case, the leg appears straight, is strong and well boned, but never coarse nor weedy. Improperly constructed front assemblies, including poor shoulder placement, short upper arms, out at elbows, lack of angulation and fiddle fronts, are all serious faults. Pasterns strong and slightly sloping. Any tendency to knuckle over is a serious fault. Dewclaws may, or may not, be removed. Feet not too long, between hare and cat foot, with hard, tight pads. The nails are strong and short. The coat is rough, long without exaggeration and harsh to the touch, with a thick shorter undercoat. It is never silky or woolly. The eyes are surmounted by long eyebrows, standing forward but not obscuring the eyes. The ears are covered by long hair. The lips are covered by long hair forming a beard and moustache. The tail is well furnished with hair. The overall appearance is casual and tousled. 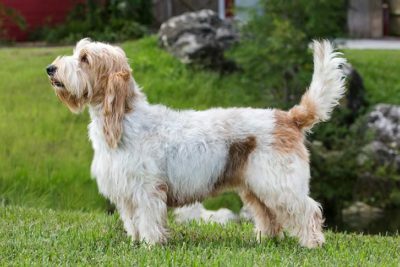 The low-slung, shaggy-coated Petit Basset Griffon Vendéen is a vivacious French rabbit-hunting hound known for a happy demeanor and durable constitution. Bred to work in a pack, PBGVs enjoy company and do well with other dogs and kids. 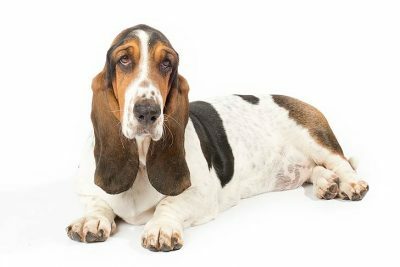 A loose translation of the name describes the dog well: Petit (small), Basset (low), Griffon (shaggy), Vendéen (from the Vendée region of France). 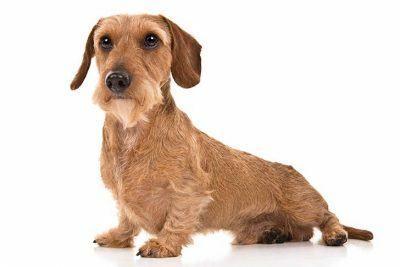 Put it all together and you have a diminutive hound, standing 13 to 15 inches at the shoulder, with short but strong legs and a rough tousled coat, bred to hunt rabbits on the rugged west coast of France. Other distinctive features of these little extroverts are a proudly carried head, a saber tail, and a loud, houndy bark. The PBGV should do well on a high-quality dog food, whether commercially manufactured or home-prepared with your veterinarian’s supervision and approval. Any diet should be appropriate to the dog’s age (puppy, adult, or senior). Some PBGVs are prone to getting overweight, so watch your dog’s calorie consumption and weight level. Treats can be an important aid in training, but giving too many can cause obesity. Learn about which human foods are safe for dogs, and which are not. Check with your vet if you have any concerns about your dog’s weight or diet. Clean, fresh water should be available at all times. 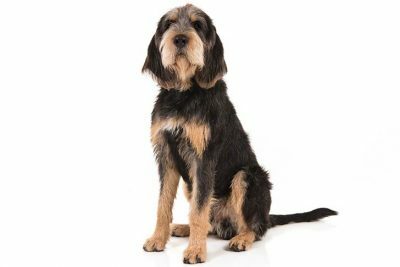 The coat of a PBGV is one of its most distinctive qualities, but can be a source of frustration for those unaccustomed to dealing with it. It should be harsh and thick—some liken it to the hair of a goat. 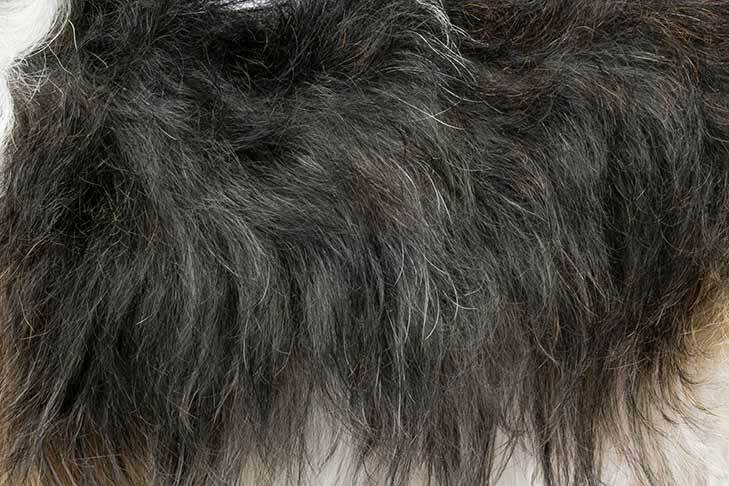 Your PBGV should have a complete brushing-out at least weekly. After brushing, you should be able to run a comb through the coat easily. Trimming should be kept to a minimum. The PBGV’s tousled appearance is part of his charm. Most people follow a bathing/grooming routine on a monthly basis, which includes a good, thorough bath and a nail trim. The ears should be checked weekly, and any excess wax and debris should be removed to avoid infections. The PBGV is a very active, curious dog who requires a great deal of exercise. He must have plenty of room to wander and explore. The PBGV has an extraordinary sense of smell and an often irresistible urge to follow scents that interest him, so exercising him when outside of his yard should always be done on a leash, as he will be prone to follow his nose and ignore all else. He makes a good companion for a hiker, runner, or biker who enjoys an active partner on jaunts. PBGVs have a reputation for being hard to train. In fact, they are very intelligent, but they tend to have a mind of their own. Socialization and obedience training should begin early and will teach the PBGV to be a good companion and canine citizen. The trainer must stay one step ahead in keeping his dog entertained and interested in what he is trying to teach. It is not that the PBGV is not eager to please; he is. However, his agenda just might be a bit different from your own. And his will seem infinitely more interesting. 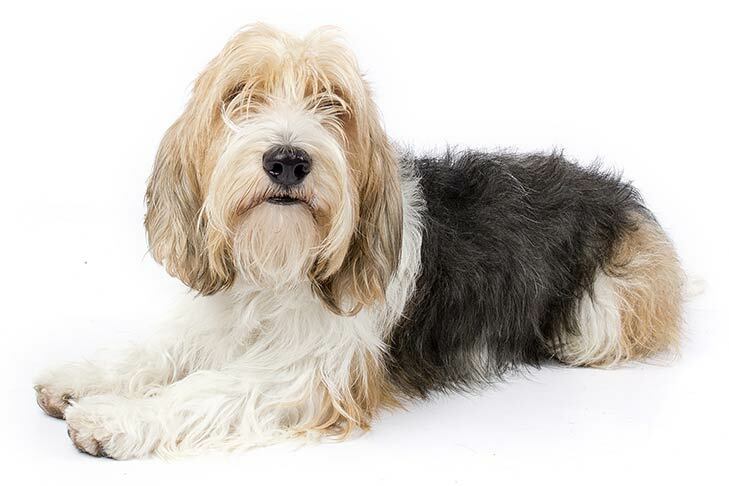 The PBGV is a healthy breed overall, and responsible breeders screen their stock for health conditions such as neck pain syndrome, hip and elbow dysplasia, patellar luxation (slipped stifle), and cardiac and eye anomalies. It is important to purchase a puppy only from a reputable and dedicated breeder who does genetic health testing on all of their breeding stock. ​The terrain of the Vendée ain’t for sissy dogs. It takes a tough, tenacious, headstrong hound to earn a living as a hunter amid the rocks and dense underbrush of coastal France. The PBGV’s rough coat was purpose-bred to protect him from this harsh environment. Even the rakish eyebrows, beard, and mustache that give the breed a large measure of its Old World charm aren’t strictly for cuteness: They protect sensitive areas of the face from thorns and thicket. The Petit Basset Griffon Vendéen entered into Regular Classes on February 1, 1991. The breed can be traced to the sixteenth century and to the Griffon Vendéen, his larger, more powerful ancestor. The Petit Basset Griffon Vendéen Club of America was founded at the AKC Centennial Show in 1984. The breed was admitted to AKC registration effective December 1, 1990. The Petit Basset Griffon Vendéen is AKC's 131st breed. His name in French reveals much about him: petit - small; basset - low to the ground; griffon - rough or wire coated; and vendéen - the area of France in which he originated. 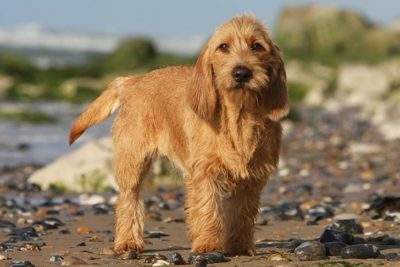 In the United States, Petit Basset Griffon Vendéens are referred to as "petits", in England as "griffs" or "roughies", and in Denmark as "griffs" or "petits."